Ghayal Once Again starts out wobbly but gains substantial momentum till interval point, only to go completely haywire in its latter half, writes Sukanya Verma. Every single time Sunny Deol got angry in Rajkumar Santoshi’s Ghayal, I thought he would actually tear the screen and erupt from it. His fits of fury felt so overwhelming and tangible. Twenty-six years later, he’s back to playing the same character in a new story with some nostalgia and very little skill. That it’s not directed by Santoshi but Deol himself, also taking top billing in writing credits, has something to do with it. Whereas Santoshi is a master of compelling screenplay and active histrionics across versatile genres, Deol got behind the camera this one time for the Sabrina-inspired Dillagi after its original director Gurinder Chadha backed out. Direction isn’t his natural vocation as evident in the middling Ghayal Once Again, which starts out wobbly but gains substantial momentum till interval point only to go completely haywire in its latter half. Tad disappointed because all the deft action set pieces, preceding the unforeseen melodrama (on FaceTime, no less) led me to believe I could expect better. Also, this abrupt shift of tone in the third act could not be more contrived. Already the rationale offered behind continuing Ajay Mehra’s (Deol) story from where Ghayal concluded is preposterous. But because the Bollywood hero of yore IS above the law, you shut up and concede. Like how after publically gunning down the villainous Balwant Rai (Amrish Puri), not to mention the unaccounted causalities before, Ajay gets off leniently with only 14 years in jail. Interestingly though, scenes that evoke fond memories among fans to Ajay are a painful reminder of the torture and torment he’s endured. They’ve scarred his psyche enough to regularly pop pills (prescribed by his omnipresent neurologist Soha Ali Khan) and sport a funky Polar heartbeat monitoring watch on his wrist. In the next decade or so, he’s set up a successful vigilante newspaper agency called Satyakam, an obvious hat tip to father Dharmendra’s acclaimed film, wherein he unlawfully abducts and exposes society’s wolf in sheep’s clothing. Just imagine a more technology-savvy, less skull-smashing version of the brawny actor’s self-styled Deva ki Adalat in Ziddi. 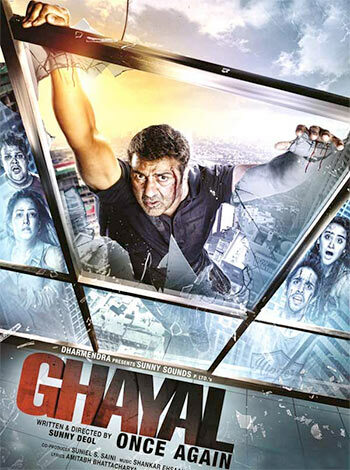 Ghayal Once Again takes off when four college-going teenagers (only the kid lugging around a Miniature Pinscher in her bag stands out) capture incriminating evidence on video and bring them to Ajay’s notice. Because it features former cop Joe D’Souza (Om Puri in a token appearance) with whom Ajay’s become good friends over the years, he takes even more interest. This controversial footage makes both Ajay and the kids a hot target of the influential business magnate Raj Bansal (Narendra Jha) who resides in a tall, ugly building that appears to be, hold on, Reliance owner Mukesh Ambani’s Antilla? Odder bit is, Reliance Entertainment led by Anil Ambani, is one of the producers of Ghayal Once Again. Bansal’s indulgent parenting and wife’s (a charismatic Tisca Chopra) neglect has resulted in a spoilt, wayward, druggie son and prayer-obsessed little daughter. It’s the sort of dark, dysfunctional family that needs to be projected with a touch of dry humour but Deol’s sensibilities lack an adventurer. Still, Jha’s dilemma comes through in a father who’s juggling between panic and pride. It’s not always sufficient to make up for the indifferent acting from the younger members of the cast. Nor is the puny writing where dialogues read out like t-shirt slogans and emotions cook faster than two-minute noodles. Fortunately, Ghayal Once Again wraps in about two hours and does away with all that was wrong in the first one -- songs, comedy to focus on elaborate chase sequences -- involving the kids in a mall conspicuous by unconcerned shoppers and invisible security or a reliably invincible Deol and a Frank Martin clone over a LaCie hard drive. Nice bit of detailing there. Only the rugged, shockproof model could survive the ensuing destruction and daredevilry. Loosely reminiscent of True Lies, the climatic action is a dampener. Overdone in tacky CGI, its intended heft is lost in wishy-washy virtue and unconvincing sentimentality. There’s only one solid reason to watch this reboot -- Sunny Deol.